I own a pair of hot pink tights. Yesterday I wore my hot pink tights. I wore them to class. Then I wore them home. Then I wore them while baking these muffins. I call them my disco tights. And because for some reason, when I wear them, a disco ball suddenly appears above my head. And follows me wherever I go. And starts playing Girls Just Wanna Have Fun twenty-three minutes past every hour. You would think I would have stopped wearing them by now. But to be honest. I kind of like it. 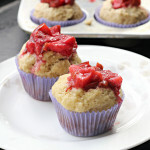 Now I’m not saying that you need to wear hot pink tights in order to really effectively make these muffins. But. Did having Cyndi Lauper blaring in the background make them taste better? I’m not comfortable saying that it didn’t. I’ve made quite a few blueberry muffins in the past. What I like about these is that (a) they only call for 3 tbsp of butter, (b) they call for cinnamon, and (c) they are not overly sweet. Meaning that they actually are perfect for breakfast (in bed) and are not really just cupcakes-in-disguise. Although I would definitely recommend topping them with lemon glaze, as I did here. It really makes them pop. And is probably what convinces you that you should have seconds. Or thirds. Not that I ever really need much convincing. 1. Preheat the oven to 400. Line a muffin tin with paper liners or grease. 2. Mix together the dry ingredients in a bowl. Beat together the egg, milk, butter, and lemon zest. Make a well in the center of the dry ingredients and pour the wet ingredients into it. Using a large spoon or rubber spatula, combine the ingredients swiftly until all the dry ingredients are moistened. The batter WILL be lumpy. Stir in the blueberries. 3. Spoon the batter into the muffin tins. Bake 20-30 minutes, or until a toothpick inserted comes out clean. Remove from the oven and let rest for 5 minutes before taking them out of the tin. Mix together until glaze reaches the consistency of maple syrup. Put into a bowl. Dip muffins into glaze. This is my submission to this week’s I Heart Cooking Clubs, the theme of which is Breakfast In Bed! i don’t know if i can top that! These muffins are exactly what I need for today’s breakfast, evening snacks and for a midnight munch.Love the fact that these have less butter, cinnamon spiced with just the right amount of sweet..does this make it a guilt-free num num? Oh Yeah! Looks awesome Joanne! I love the honey glaze idea. I love pink..and if you can carry pink pants, you are quite a fashionista! Georgous & divine looking muffins, Joanne! hot pink tights…back in the 80’s where I left them. Hope they still turn out okay! Beautiful looking muffins. I like that they have less butter. 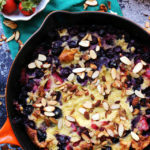 I have been looking for a good blueberry muffin recipe..so thanks! I bet your are adorable in your pink tights. I love it! They sound like happy clothes. I love happy clothes. I have a sparkly, multicolored belt I wear with jeans sometimes. My husband thinks it is weird. It makes me smile! If I saw you in your pink tights, I would smile. Thank you Joanne for your kind words. I feel much better now ans I made a really nice meal for me and my husband. I love muffins. They look really yummy. For me it is very hard to find blueberries here in Greece. And if I do I will pay them a fortune. I printed out a recipe just yesterday for blueberry muffins with lemon curd. Now I want these, too. Mmmm. There’s not much that I enjoy more than a quick muffin that tastes amazing. Hot pink tights make everything better;D Even better if you dance while wearing them! These are scrumptious! I love the lemon glaze! That’s Good Enough for Me, Ya-ya-ya-ya-ya-yaaa, Hup! I love a muffin that isn’t over sweet and these sound perfect me to. You always start my day with a smile, although now I can’t get that song out of my head – UGH! Great minds do think or bake alike… your muffins look fantastic. 3 tbsp of butter…I am surely gonaa try these !!! That’s hilarious, I used to have a pair of boots that would make “Walk” by Pantera play in my head every time I left the house. I miss those boots. The muffins sound wicked good, I like a less sweet one too. That’s hot….hot pink tights! 😀 Love your muffins. Looks moist and delicious. Ummmm….I’m trying to picture you in hot pink tights at med school. Any comments from your colleagues? The muffins look divine. I’ve never cooked with almond milk. ok i really wish i could have one of these right now! hey congrats you won my $50 gift certificate giveaway. check your email. congrats! Ha ha, what does Pinky make me think of???? Ok ,hullo Kitty yeah sure it does!!! Bdw, i did go out once ,to a resort club ,awhile ago,after midnight ,on my birthday , in my satin Pink PJ’s, ha ha, a drive was what we began with ,and landed at the club of the resorte ,he he he!!! These sound delicious I love blueberry muffins, I can’t wait until our local blueberries are in season. I agree with you that a muffin should be a muffin. I love how healthy these muffins are without sacrificing texture or flavor. The glaze on top is a fantastic addition. Love the tights…do we get to see a pic? 🙂 I am definitely going to have Cyndi stuck in my head the rest of the day, lol! Disco tights?? Disco Ball?? I want some! Yum, blueberry and lemon. These sounds wonderful. atta girl! if you’ve got it (and pink tights), flaunt it! these muffins appear to be the quintessential blueberry muffins, and the glaze is oh-so-awesome. lovely pictures. Now I like the idea of your wearing hot pink tights, but seriously, I am having doubts! You say you wore them to school!!!!! I am having serious doubts, but then again, you are a New Yorker, you are fearless, you are daring and you like flash! I like flash, too, on Cindi lauper! Hey these muffins look good except they should have had raspberries to go with the tights, no? Nice looking muffins there! Picture perfect! I can’t believe this is my first visit here! I enjoy your blog! Your muffins look absolutely divine Jo! I haven’t had blueberry muffins in a while. Lemon glazed, they must be delicious. Thank you. I love muffins who are muffins, non identity crisis ones. And hot pink tights? YEAH I used to own a pair, and those electro blue ones. whooopie! I just have some boring black tights. I want pink disco tights! 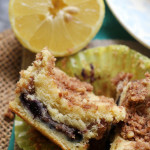 Love blueberry with lemon – muffins, I mean. I have been thinking to make some blueberry muffins for the breakfast….and yours look totally mouthwatering! Beautiful muffins! I was planning on making some this weekend if I have the time. I do love blueberries! i think i would have to get hot pink tights to make these now, they would just make them better! i love these! blueberries and muffins are the best combo! These look so good! Also I really needed a good laugh, and you are always so darn funny! I just love reading your blog! Looks like you’ve got your muffins all lined up in a row! Seriously though, they look so physically cute that, in addition to their obviously sounding delicious, I have to try them. I just need a muffin pan. Maybe when I’m home next week I’ll remember. Nom. Muffins looks absolutely gorgeous..loved the idea of honey-glaze..glad to follow you..
Ah, wouldn’t take much to convince me to have more than one of these either! I really love the glaze! Haha, I used to own hot pink tights, too! I think my mom forked them over to Good Will in 1989, however 😉 Kidding, kidding! You rock them, I have no doubt! These look wonderful! There’s something about blueberry and lemon together that makes my stomach growl with anxiousness! Hey Joanne, I want a sit around my house, wear pink tights, listen to girls just wanna have fun, and eat these muffins! Yes! You in hot pink tights….oh man. Please. We need a picture. Look like yummy muffins. I made his Savory Muffins and added sausage and red pepper. The man is a genius and we are geniuses to bake his recipes. Muffins are the perfect combination! I bet you look cute in your hot pink tights! 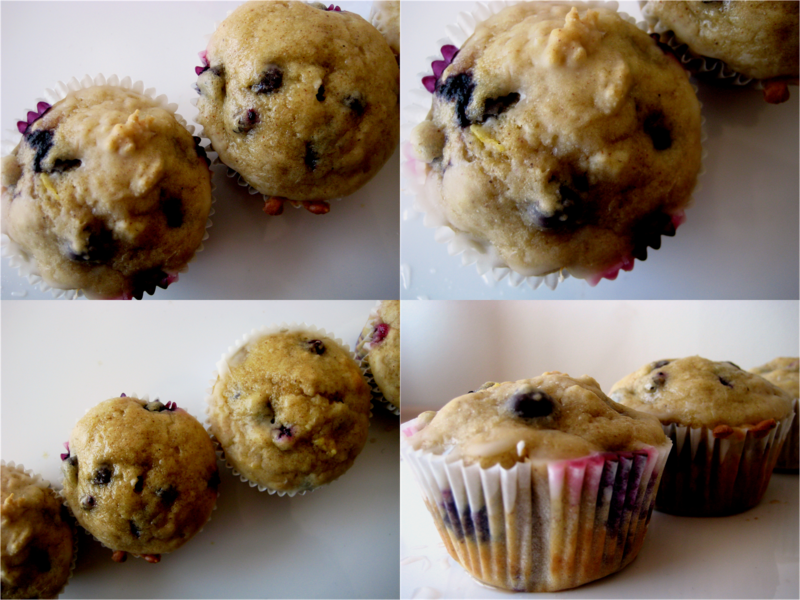 The muffins are delish with my favorite berry in them – and that sweet and tart lemon glaze! These sound so good. And credit to you for rocking bright pink tights. You’d never see me wearing those! I don’t think I’d need to have much convincing to have 2nd’s or 3rd’s, either! OMG Joanne these look SOOOO good. So good. Will be making these for sure. I love that you are still wearing your pink tights, and I love the look and sound of these muffins. They look like little bites of heaven. I love blueberry muffins. 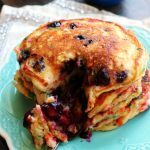 The recipe I always use is the one my mom always used after picking our own blueberries. My dad would poke holes in tin cans, put a string through it and we’d put it over our neck (presumably so we could use both hands) and send us to the blueberry bushes. YUM! Anonymous – Thanks so much for catching this! It is tsp. I will change the recipe to reflect this!